According to an August 2 post on Snow’s Facebook page, the cat has been declared fully healed. 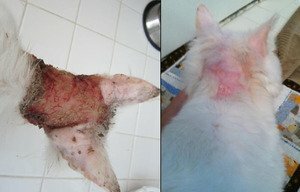 Before and after: Snow when he was brought into Paws for a Cause Feral Cat Rescue in April (left) and a photo posted August 2. Snow was found in April in Sterling Heights, Mich., when a couple noticed the stray cat in their backyard. The feline had been burned with some kind of chemical acid. After four months of treatment and rehabilitation, Snow is as good as new (aside from some missing patches of fur on his neck). Snow is FIV positive, which is what makes his recovery even more amazing. Typically, cats with a weakened immune system are more prone to infection and it’s difficult for them to recover from injuries. To date, Paws For The Cause Feral Rescue, the facility that cared for Snow, raised more than $8,500 for the feline’s recovery expenses — the initial goal was $7,000.